Billy Robertson’s time as a member of Bellahouston Harriers slightly over lapped with the great squad of Braidwood, Coyne, Daly, Fleming, Getty, and company and it is a tribute to his running and determination that he is able to be ranked alongside these superb runners. Billy (Date of Birth 16th April, 1957) came late to the sport and arrived arrived suddenly without warning, as a top flight distance runner. Unlike all of those mentioned above, he had no career in the sport before 1985: he had never run as a Junior, Youth or even Senior Boy. Where did he come from? The picture gives a wee hint. 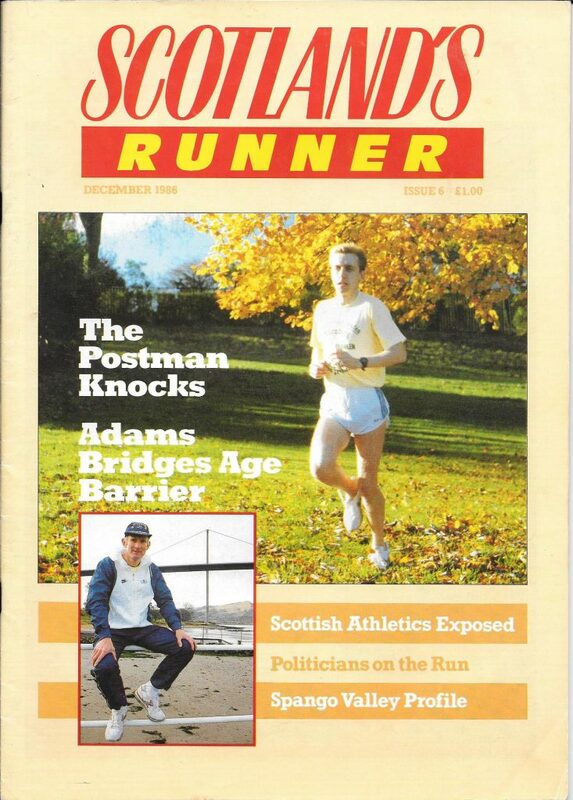 Alan Campbell told the story for ‘Scotland’s Runner’magazine as follows. “His sporting passion was football at which he played sweeper for East Kilbride Sunday League side Newlandsfield Amateurs. While a competent player, he was unlikely ever to press Willie Miller or Alan Hansen for a place in the Scottish team. The 1985 Glasgow Marathon was only four weeks away and his wife Diane kept asking, “Are you doing this Marathon or not?” Billy decided he would put in a 13 mile training run two weeks before the big day and ended up with a time of 3:52. That was when Billy decided he might be better at running than football. Incredibly twelve months later, Robertson was seventh in the Glasgow Marathon in 2:20:42.” And that is the story of the two photographs above: Billy holding the trophy for the football team, and about to cross the finishing line in the 1986 Marathon. Billy confesses later in the same article in the December, 1986, issue of the magazine that he had actually tackled a marathon before 1985. “I was quite fit, playing football on Sundays and training for it one night a week. The plan was for the football team to enter the marathon that year but they never got around to it. I still wanted to do it. Just for the achievement. It was supposed to be so tough. I trained for about 10 weeks going out on long runs although I built up slowly. The longest run I did was 20 miles at about eight minute a mile pace. … The race was an anti climax. I had heard so much about hitting the wall but I found the whole run quite comfortable.” His time on that outing was 3:16. He had thought of joining East Kilbride AAC but a couple of his colleagues ran for Bellahouston Harriers and that is where he ended up. 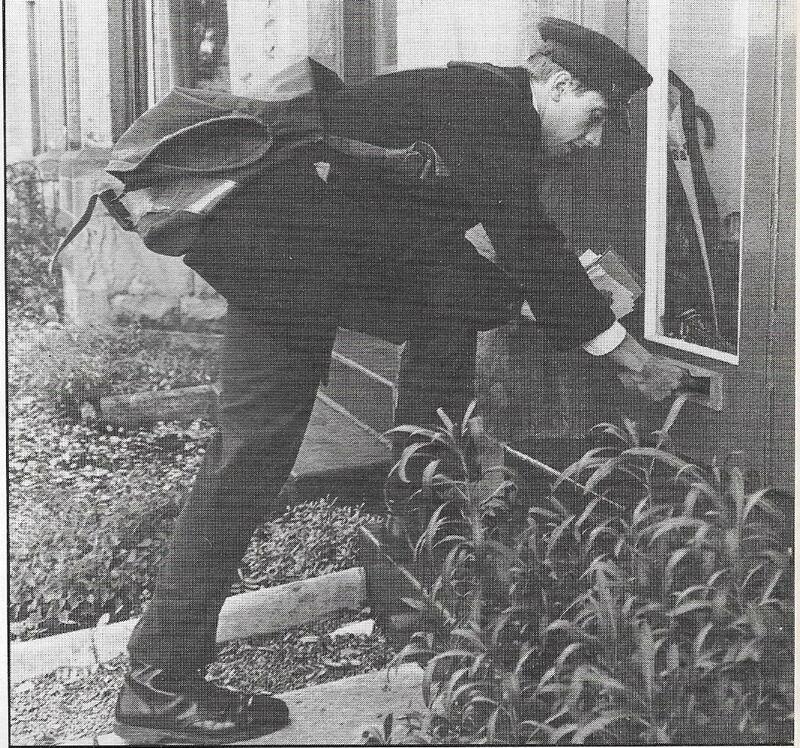 The postman was now a club runner with a 2:20 marathon behind him. At the start of season 1985 – 86 Billy was a member of a really successful athletic club, it was October and he would learn that the season started with the relays. At the start of the month he went down to the club to find himself in the trial for the McAndrew Relay Race at Scotstoun. It was a hard race – and with the top clubs the trial was often as hard as the race itself – and he was a bit down afterwards. He had never raced as hard over any short distance and convinced himself that he had only joined up for training purposes, not to race. He didn’t run in the McAndrew but the following week he was persuaded to turn out in the Renfrewshire Cross-Country Championships. He ran in the seventh club team that day and found that he really enjoyed it, despite the rain and the cold. By the National Cross-Country Relays on 26th October he was running for the first team (in the absence of Fleming, Daly and Braidwood) and acquitted himself honourably. He then raced the following day in the Alloa Half Marathon, he’d never raced one of those before, and finished 4oth in 1:14. It was at this point that he decided to stop the football – he liked running more than the ball game by that time and there was always the injury risk attached to it too. He couldn’t do both, so the football was dropped. By now he was training with Andy Daly and the others on a Sunday for the long run and on Tuesday and Thursday at the club. He was also going to Crown Point track on Wednesdays to train with Peter McGregor’s group and, being a postman finishing at mid-day, he was able to rain in the afternoon on Monday and Friday. But back in the racing world he was still a new boy, despite his ability, and did not makethe strong Bellahouston team for the Edinburgh to Glasgow eight stage relay, the places going to such as Fitzsimons, Daly, Braidwood, Fleming, Getty, Coyne and Adair. Injuring his heel in the Pollok 10K in January he was out of action for 10 weeks. Unlike many runners with an injury, he didn’t attempt to ‘run it off’ instead he had treatment and massage from Ricky McFarlane, former St Mirren manager and there were regular visits to the Eastwood Toll Swimming Baths. At the start of the track season he ran the Clydebank Half Marathon in 71:40 and then tackled another at the same distance in Stirling. Here he came through 10 miles, running alongside Hammy Cox, in 51:15 compared to his existing 10 miles pb of 56:35. His finishing time for the Stirling Half Marathon was 67:47 for ninth place. This was the race that convinced him that he could run with the best of them. There were lots of half marathon on the calendar at that time and he turned out in the Glasgow Half Marathon in August. He ran awayfrom the field with training companion Andy Daly and they finished together in 66:48. The judges, always keen to have a declared winner, gave the verdict to Billy. Andy agreed that Billy should take the prize of a flight to any destination in Europe! But two days after the half marathon, Billy won the Renfrewshire Track 10000m in 30:45. 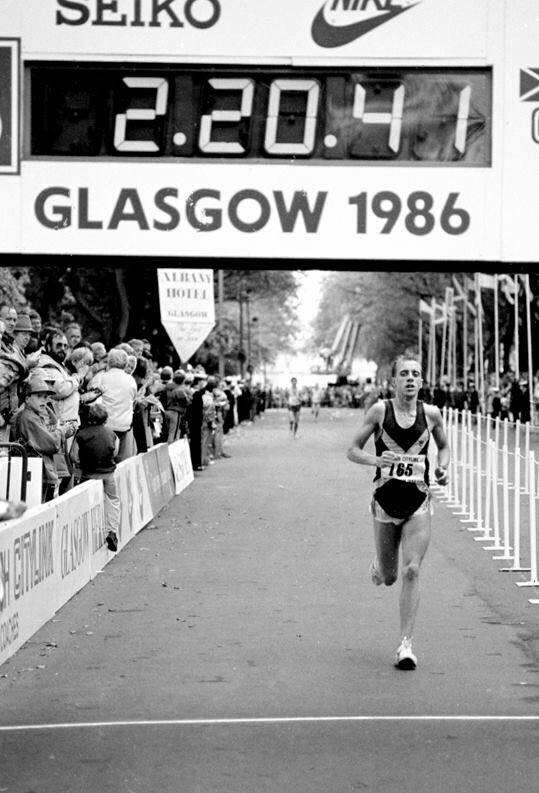 The next big one was the Glasgow Marathon of 1986 – his first as a serious runner. Running with the lead pack he was quite comfortable through 10 miles in 53 minutes but when Kenny Stuart made a break at 11 miles he didn’t know quite what to do – it was the first time he’d raced a marathon. He let them go and had several bad experiences – a bad patch at 12 miles, stomach cramp on the Barrhead Road – but finished seventh, first Glasgow man home and a time of 2:20:42. The place earned him a trip to the Nurnburg Marathon, the city being twinned with Glasgow. He was a bit anxious about racing two marathons so close together but he finished second over the four lap course in 2:26:16. It is a reflection the standards at the time that his 10000, time of 30:45.0 only placed him 20th Scot in the annual ranking lists and even more astonishing that 2:20 for the marathon only placed him 14th. His first season as a runner had been a success and all runners are interested in what others do in training. The ‘Scotland’s Runner’ magazine gave us a typical week’s training at the end of 1986 for Billy Robertson. Monday: Long Run (18-20 miles) at 6 minute mile pace. Tuesday: Sri Chinmoy 2 mile race on Glasgow Green. Thursday: Ten mile club run at 5:40 pace. Friday: Five miles, easy pace. By October 1986/87 he knew about the relays leading up to the Edinburgh to Glasgow on the third Sunday in November. He was ready for the McAndrew and ran the first stage for the Bellahouston team which contained Peter Fleming, Robert Fitzsimons and Tony Coyne and finished third. He was second quickest member of that quartet and was asked to run the first stage of the Renfrewshire Relays the following week at Linwood. This time the team included C Thomson, Daly and Coyne. Again the team was third and he had third fastest club time, one second slower than Daly. He missed the West District relays in Clydebank and the National relays on the last Saturday in the month, the twenty fifth. Why did he miss those races? The Nurnburg Marathon was on the 26th October where he was second to Przybyla (Poland) and Allan Adams, Senior, from Dumbarton was fourth in 2:29:07. Billy was ready for the Edinburgh to Glasgow this year and on 16th November he ran on the very difficult second stage where he moved his club from 16th to 13th for the team that finished 10th. It was a good solid run against the top men. The New Year started for Billy with the Springburn Cup raceat Bishopbriggs on 10th January when he was eighth, one place behind George Braidwood for the team that won the event. On the 18th of the month he ran in the Pollok Park 10000m race and finished fourth behind Peter Fleming, Graham Crawford and Bill Scally and just ahead of Andy Daly, John Hendry and R Guthrie. With their counting runners placed 1, 4 and 5, Bellahouston won the team race from Bellahouston B team with runners 6, 7 and 16 with Maryhill third and Kilbarchan fourth. Two weeks later, on 28th January, at Riccarton in Edinburgh he was second in the Civil Service Championships, one place behind Bill Nelson and one ahead of Andy Daly. On the 31st January he was sixth in the prestigious Flockhart Memorial Race at Coatbridge. On 7th February, with the championship season starting to reach its climax, he ran in the Renfrewshire County Championships and finished second to Peter Fleming and again Bellahouston won, this time by 64 points from Spango Valley AC. In the West District Championships at Kirkintilloch, Billy finished 16th to be fourth Bellahouston runner in the squad that finished second, 20 points behind Spango Valley. The National Championships were held on 28th February, 1987, at Falkirk and Bellahouston Harriers was second team, behind Edinburgh Southern, with Billy fourth club counter in 27th place. The last championship of the year was on the 28th March and it was the Six Stage Road Relay. Billy was on the 3rd stage He pulled the team up from 8th to 4th and was the fastest club runner on the short stage. It was then on to the summer season. Into the summer of 1987 and Billy ran in the Civil Service 10 miles in Strathclyde Park on 15th April where he was second to Andy Daly in 51:49. Although he was almost certainly running frequently there were very few 1st, 2nd or 3rd places noted in the results columns of Scotland’s Runner or the Glasgow Herald. There was a 10K Road Race in Govan on 6th June when 277 runners competed, Billy was second to Frank Harper of Pitreavie in 31:31. He followed this with second in the Clydebank Half Marathon on 14th June where he was beaten into second place by Alex Gilmour but recorded a time of 67:48. On 16th August he ran in the British Airways Glasgow Half Marathon and was second to clubmate Peter Fleming in 66:13. 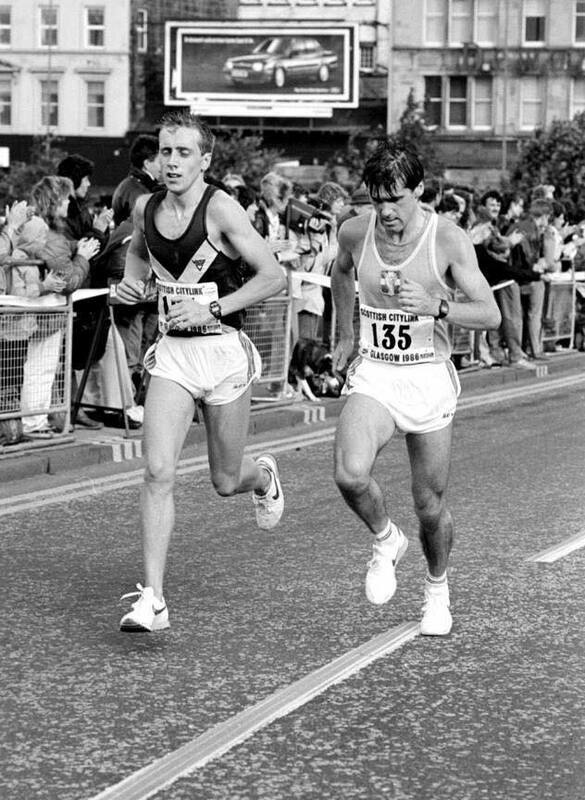 The Glasgow Marathon in 1987 was run on 20th September and Billy was in there competing. Statistics tell us that there were 8500 entrants (the previous year there had been 14,200), 25 finishers under 2:30 (previous year 33), and 500th place was home in 3:02:32 (the previous year it was 2:5758). Billy finished eighth in 2:22:13 and won £100 for that. The race was won by Eamon Tierney of Clonliffe in 2:19:09 from Terry Mitchell (2:19:40), Hammy Cox (2:19:43) and Greg Newmans of Cardiff (2:19:55). Billy’s time was good enough to see him ranked 15th in Scotland at the end of the year although it would have seen him third Scot in 2018. He was also ranked 8th in the 10000m with 30:07.9, would have been 7th in 2018. October 1987 started the winter relay season with a win for Spango Valley at the McAndrew Relay on 3rd October but Bellahouston finished third to start among the prizes. The following Saturday it was the Renfrewshire County Championship where the Bellahouston team of Daly (12:39), McAngus (12:25), Thomson (13:20) and Robertson (12:28) won from Spango Valley. The West District Relays were at Strathclyde Park and Bellahouston’s squad of Coyne, McAngus, Robertson and Fitzsimmons was fourth team – Billy Robertson was sixth fastest individual on the day. Fitzsimmons and Robertson were switched the following week for the National Relays at Annan although the team personnel remained unchanged. They were fifth this time. Billy skipped the Glasgow University Road Race and on 15th November he ran in the Edinburgh to Glasgow relay. By common agreement the two toughest stages in a race without any easy stages are the second (the stage of champions) and the sixth (at 7 miles the longest in the race). Billy was out on the sixth stage where he took over in 11th place and picked up one place and a lot of ground to hand over in 1oth for the team that finished seventh. At the end of the month (28th) he was running for the club in the County Championships at Greenock where he was second to Tommy Murray for the team that finished second behind Spango Valley. He started December with a run for the SCCU in an international cross-country match at St Andrews, finishing seventh: the team won. The next championships were the West Districts – held at Houston in Renfrewshire on 16th January 1988 – in which the Bellahouston team finished second to Cambuslang. Then came the big one on 22nd February when the National Championships were held at Beach Park, Irvine, and Billy had a good run to finish 15th for the team that was missing a few of the top men and finished 14th. In March he had another representative call-up and ran in the Cumbernauld Inter-Area Match where he was second to Eddie Stewart on the tough undulating and in places very muddy course. The final club championship of the season was the Six Stage Road Relay at Livingstone on 26th March where the team won third place medals and Billy ran on the final long stage of the race. 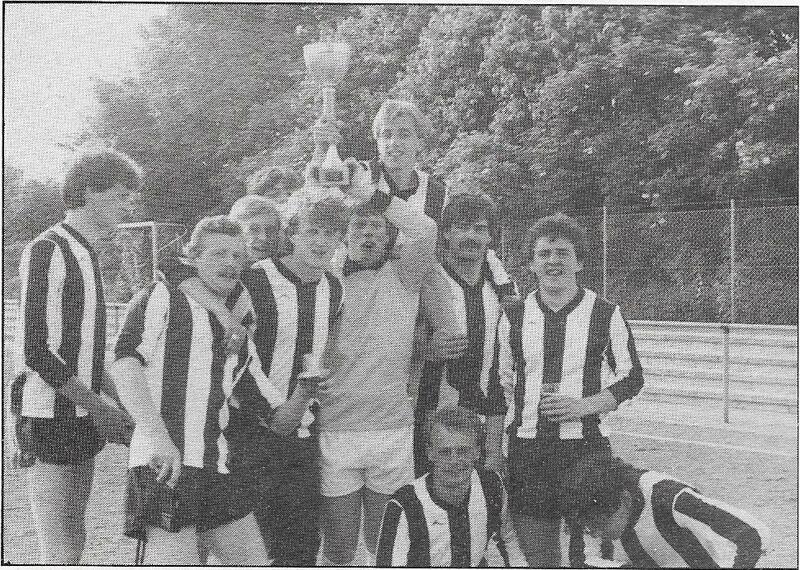 There were no weak links this time – Fitzsimmons, Daly, McAngus, Fleming, Coyne and Robertson made up the team. The runner for the winning Springburn team was a former Bellahouston hot-shot who had moved to Springburn and joined the local club: none other than George Braidwood who kept them in the lead although Billy had the satisfaction of running a time of 29:32 to his rival’s 29:51. It was then into summer racing mode on the firmer surfaces of tar and tartan. Billy was less than half a minute behind the winner in a hard fought race. This would be the only SAAA track championship medal he would get – but remember that he was running at a time which might well be regarded as a golden age of Scottish distance running. 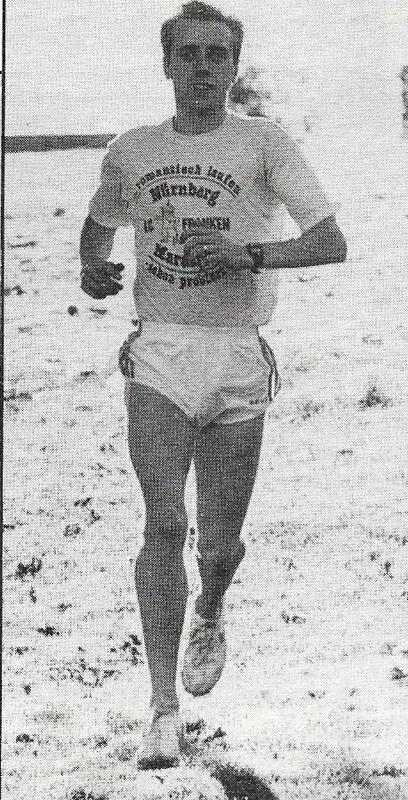 The 1988/89 winter did not start well for Billy who missed all the relays – a man who had run in every relay for the club over the previous years was absent even in the National Relays when the club had no fewer than six four man teams finishing the race. He even missed the Edinburgh to Glasgow eight man event where he had performed well on the difficult stages in the past. Into the New Year of 1989 and while he was listed on the programme for the West District championships at Kilmarnock, he did not start the race. Then on 4th February 1989, Billy ran in the Cumnock open cross-country race and finished third in very good company. Nat Muir won on a very muddy course in 34:33 from Steve Ovett who was timed in 36:52 and Billy in 37:22. Clearly whatever had been troubling him – he had not even urn in the Civil Service races – had cleared up. He then ran in a midweek Civil Services Winter League match on 22nd February and finished second to Bill Nelson. Further proof of his return to form came in the National Cross-Country Championships at Hawick on 25th February 1989 when he finished 34th out of a total of 546 finishers and first Bellahouston runner for the team that finished eleventh. He was back on the roads again when he ran in the Clydesdale Harriers 5.5 miles Road Race on 11th March, finishing sixth in a good field. It was back to the track on 16th February in the Civil Service Track Championships when Billy turned out in the 3000m where he was third in 8:42.0 behind Robert Fitzsimmons who had a glory day (he won both 800m and 1500m as well) and Bill Nelson. Back on to the roads and up a distance or three for the Civil Service 12 miles on 12th April: first this time in 52:48 from Mark Gormley and Jim Evans. At the end of April (30th) Billy turned out in the Kodak 10K Road Race in Glasgow (always a high quality field) and finished 14th ahead of Nat Muir, Chris Hall, Doug Frame and Brian Emmerson in 30:06. He followed that very quickly with a fourth place in the Adidas Torsion 8K also in Glasgow on 3rd May behind Bobby Quinn, Peter Fleming and Tommy Murray. 27th May saw the West District Track Championships and like many distance runners Billy was back on track. This time he finished third behind Bobby Quinn and Tommy Murray in 14:46.8 to the winner’s 14:23.5. Billy did not compete at the SAAA Championships at the end of June 1989 and next appears in the results columns on 19th July when he was second to Eddie Stewart of Cambuslang in the CIBA Geigy 5 miles road race in 24:47. By the end of the summer, Billy was only ranked in one event – 5000m where he was 24th Scot with his time from the West District championships of 14.46.8. Not in the top 21 for the 10000m and, if he did run a marathon, he was outside the top 20 (2:30:36). 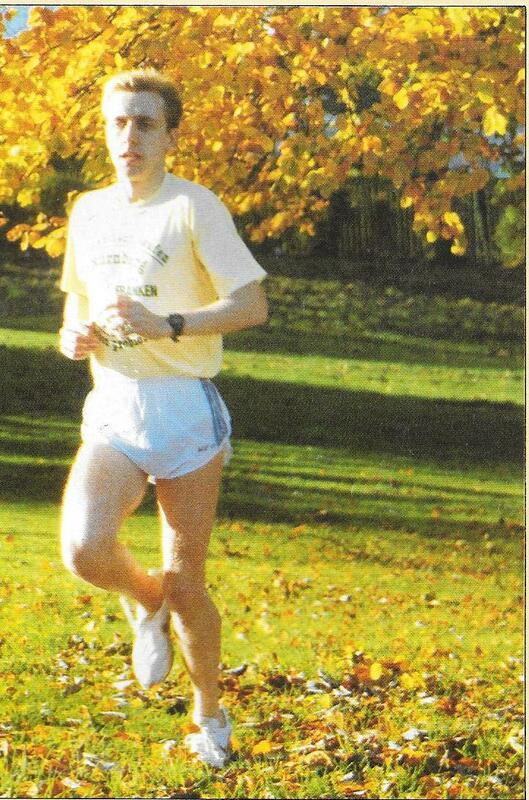 At the start of the winter, on 7th October 1989, Billy was absent from the Bellahouston Harriers team that finished eighth and the following weekend there was no Bellahouston Senior/Junior team in the Renfrewshire Relay championships which were won by Kilbarchan from Greenock Wellpark Harriers and Spango Valley. He was also missing when Bellahouston Harriers fielded five teams in the West District Relays on 21st October, and in the National Relays a week later when the club had 3+ teams out. He was able to run in the Edinburgh – Glasgow relay however and was fit enough to be asked to tackle the long 7 miles of the sixth stage. He ran well enough to pull in one lace taking the club from 11th to 10th. Not only that but he had the second fastest time of the day, just six seconds slower than Anglo-Scot Neil Tennant of Edinburgh Southern Harriers and 38 seconds faster than Hammy Cox. They were the only three runners inside 33 minutes for the stage. Thereafter whatever the injury was, Billy missed both the Districts and the National championships. His only race so fay in the season had been on the roads in the Edinburgh to Glasgow Relay, and his next run for the club was in March in the Six Stage Relays where he ran the fourth stage for the team that was ninth. He ran a respectable time of 30:32 for the long stage – 21 seconds slower than Peter Fleming on the second stage but two minutes quicker than Gavin Bell on the last leg. He was clearly in good condition. It was now into the summer of 1990 and it was a summer that Billy Robertson would want to forget. He was nowhere to be seen, as far as racing was concerned, not on the track and not on the roads. Winter 1990/91 was anther where he was not seriously involved. He ran in none of the relays, not even the Edinburgh to Glasgow, nor in any of the major championships. To all intents and purposes, Billy’s career was over – there would be no more fast marathons or cross country championships. It was a brilliant career which had been ended, almost certainly, by injury. In 1992 he was ranked thirteenth in Scotland over 10000m on the track with a time of 30:40.46, run when finishing twelfth in the Scottish championships on 3rd July . At the early age of 35 his time as an athlete had been cut short by constantly recurring injury.